Home » Life in London » Digital » What’s in a Selfie? For those of us who consume online media regularly, there are some items that we tend to come across everyday. 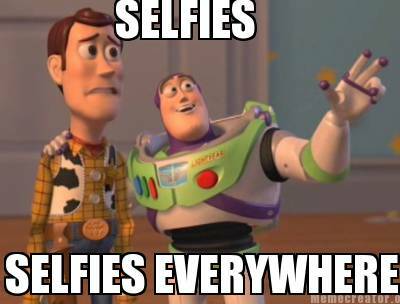 Selfies, just like infographics, are one of these items, and we have recently started to see a new and disturbing selfies trend. So, I wondered what is an selfie, why it has caught on. To begin with, I reached out to the Oxford Dictionaries to find out if they actually list the word there, which they do! The word selfie is a combination of self and the suffix -ie. It is a photograph that one has taken of oneself, typically one taken with a smartphone or webcam and uploaded to a social media website. So, there you go. Someone has even taken the trouble to publish a definition of selfie in the Wikipedia. The plural is selfies and you can even spell it selfy, in case you were wondering. I guess that we all like preserving the memory of a visit to the Norwegian Fjords or a special night out at that London trendy venue. Back in the day, kings had someone else painting their portraits, because this would give an idea of how powerful they were and they probably didn’t know how to do it themselves. Nowadays, we just ask someone to take a picture of us. On the other hand, and given how expensive smartphones are and how individual we have become, the front camera must be a great invention. It is not the fact that we are able to take self-portraits with our smartphones that bothers me. But, the amount of them being shared in social media is positively overwhelming. If you go to social media, you’ll see that there’s a variety of hashtags to distinguish trends. So, I guess they can also be interesting and fun, but I find it hard to distinguish which ones are actually so. Everyone has joined in and got people talking about it everywhere. Remember those selfless politicians at Mandela’s funeral? But, according to the Selfiecity study, we take less selfies than it is thought. Still, one in every five people in the world own a smartphone, and this number is set to increase in the next few years. Is it maybe money? We buy expensive gadgets and we feel we need to use them for something else apart from making phone calls. Bedroom selfies are the new type of selfies. However, I do not see how they can be cool… Can anyone offer an explanation? As digital director Ann Holman (@AnnHolman) has recently mentioned, humans are often good at destroying what is good for us. Two world wars confirm this point. Anyway, just some thoughts. Over to you now. What do you think? Thanks for checking my post, and look forward to reading your thoughts. Selfies are not something I participate in if I can help it. I can see doing it if you are trying to catch a moment because you are at the top of an active volcano or you just bumped into Brad Pitt and he offered to let you take a picture with him. But bedroom selfies sounds risky socially and professionally. There seems to me no end to human stupidity when it comes to social media. Good post. In the event of me buimping into Brad Pitt (or similar) and being certain that we would not be in an isolated dessert, I may ask any passer-by to take a picture, just to make sure it is good enough. That would defeat the purpose of the selfie, right? Absolutely. I believe that it is more about us using the possibilities that technology brings. After all, front cameras tend to be not as good as the back camera in most mobile handsets.